Posted by Diane Brennan on Thursday, April 4th, 2019 at 1:09pm. Being a first-time home buyer is exciting! But I know it can also feel overwhelming—especially when you see median listings priced at $297,000 and available homes flying off the market in 55 days. With real estate trends like those, you might be tempted to make an impulsive purchase that could hurt your financial goals and keep you paying a mortgage well into retirement. No one wants that! Trust me, you guys, it’s worth doing this the right way. And that means buying a home that you love and that doesn’t hurt your future money goals. You may be thinking: Yeah, that would be great, Rachel. But where do I even start? I’m so glad you asked! I’ve put together 10 tips for first-time home buyers as they tackle the home-buying process. Put these into practice today so your first home is a blessing not a burden. Owning a home is expensive—much more expensive than renting, even if your monthly house payment will be similar or cheaper than your current rent amount. That’s because when you own a home, you’re responsible for all the maintenance and upkeep costs. And those can add up fast! So, before you even think about buying your first home, make sure you’re debt-free and have an emergency fund of three to six months of expenses in place. When you get into a home with no payments (besides the mortgage) and have a nice big emergency fund, you’ll have the cash to pay for huge expenses that suddenly come your way. You’ll be able to love the life you’ve set up for yourself because stress and worry won’t be part of the equation! Now once you’re debt-free, I want you to stay debt-free. So, as you’re shopping for your first home and getting excited about decorating and filling it with new furniture, be mindful of your budget. The spender in me knows that’s easier said than done. When my husband, Winston, and I moved into our first home, I had so many visions for what our home could look like! It was hard for me to accept the fact that I could only decorate one room at a time, but I knew our future money goals were more important than me spending all our savings at the furniture and home stores. You might have some empty rooms for a little while, but your budget and your future selves will thank you! And if you find yourself thinking, Oh well, I’ll just put it on credit—stop right there! Debt is dumb. Plus, taking on new debt in the middle of buying a house could delay your approval for a mortgage and make you miss out on the perfect home. Don’t do it! Before you get emotionally attached to a beautiful house, check your monthly budget to determine how much house you can afford. You need to leave room in your budget for other things, so make sure your monthly housing costs (including HOA fees, taxes, insurance, etc.) are going to be no more than 25% of your monthly take-home pay. That’s an easy way to find a number in your ballpark. But don’t forget that property taxes and homeowner’s insurance will affect your monthly payment. You’ll also need to factor those numbers in before settling on a maximum home price. If you use the above example and enter $211,238 into a mortgage calculator, you’ll find that your maximum monthly payment of $1,250 increases to $1,515 when you add in $194 for taxes and $71 for insurance. To drop that number back down to your monthly housing budget of $1,250, you’ll have to lower the house you can afford to $172,600. Since property tax rates and the cost of homeowner’s insurance vary, check with your real estate agent and insurance company for estimates to calculate how much house you can afford. Adjustable-Rate Mortgages (ARMs): ARMs might seem great with a low initial interest rate, but they allow lenders to adjust the rate to transfer the risk of rising interest rates (and monthly payments) to you. FHA Loans: You may be able to get an FHA mortgage with as little as 3.5% down, but you have to pay PMI for the life of the loan—that’s thousands of dollars that won’t go toward paying off your mortgage. VA Loans: VA loans allow veterans to buy a home with no down payment. But if the real estate market shifts, you could easily owe more than the market value of your home. These loans also carry a bunch of fees and usually charge interest rates that are higher than those of conventional loans. A 15-year term creates a higher monthly payment, but you’ll pay off your mortgage n half the time, have a lower interest rate, and save thousands of dollars in interest. Please don’t get a 30-year mortgage because of the lower monthly payment. When you look at the math on a 15-year versus a 30-year, you’ll realize you pay a whole lot more money on a 30-year mortgage in the long run! Let’s say you put a 20% down payment ($34,520) on a $172,600 home. Your monthly payment for a 15-year, fixed-rate mortgage at 4% would be $1,250. If you add up the interest you’ll pay over the 15 years, it’ll total $45,765. But maybe you didn’t want to pay that much every month and instead went with a 30-year, fixed-rate mortgage at 4% to lower your monthly payment to $888. After 30 years, you’ll have paid $99,236 in interest—which makes it $53,471 more than the 15-year mortgage! And, you’ll be in debt 15 years longer! Let’s see how this plays out with our example of a $172,600 home. If you multiply $172,600 by the higher 4% closing cost average, you’ll find that you need $6,904 for closing costs. Now let’s add that to your 20% down payment of $34,520. 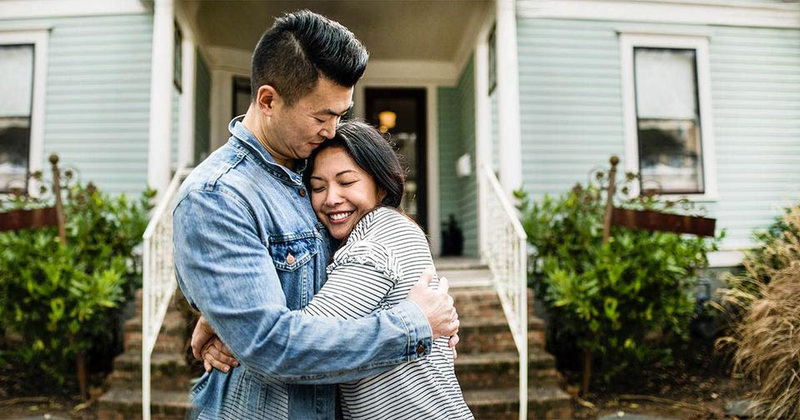 The two together equal $41,424, which is about what you’ll need to save to pay for the down payment and the closing costs on your first house. You want to save for your closing costs and down payment as quickly as possible—with the same amount of intensity I tell people to use when they’re getting out of debt and building a full emergency fund. In fact, it’s okay to put retirement savings on hold for a short period of time to save for a home—but you’ve got to hustle! Pick up a second job, sell whatever isn’t nailed down, move into a smaller space, add a roommate and charge rent—do whatever you need to do to save for your closing costs and down payment as fast as you can. Get prequalified for a loan and take the extra time to get a preapproval letter before you start your home search. Preapproval shows sellers that you’re a serious buyer, which is a great way for first-time home buyers to get ahead in a competitive market. To get preapproved, your lender will need to verify your financial information (proof of income, taxes, etc.) and submit your loan for preliminary underwriting. According to recent data reported by the National Association of Realtors (NAR), most buyers either found the home they purchased online (51%) or through a real estate agent (31%). (3) Doing both sets you up for success! Your real estate agent will email you homes that are listed on the ARMLS (Arizona Regional Multiple Listing Service) in your price range and email them to you. An MLS is created, maintained and paid for by real estate professionals to help buyers view the largest pool of properties for sale in the marketplace. Real estate agents also provide valuable market expertise and can help you find great deals on homes as soon as (or before) they’re listed. After you’ve found some homes for sale in your price range, be careful not to make a decision based on the property alone. According to a NAR survey, 78% of home buyers believe neighborhood quality is more important than the size of a home. And 57% of buyers would opt for a shorter commute over a larger yard. (4) So make sure you factor neighborhood quality and location into your decision. Ask your real estate agent for information on crime rates and the quality of schools around your prospective neighborhoods. Calculate your new commute times to see if they seem manageable. Visit the neighborhood at different times and days to check for traffic conditions, noise levels, and if people are comfortable being outdoors. Only choose a neighborhood that you and your family feel good about. Once you’ve narrowed down the neighborhoods, attend a few open houses. Looking at homes that are for sale—even if they’re not a perfect fit for you—is a great way to learn more about the area. When you eventually do find a house you love, you’ll know how your place compares to better or worse homes in that neighborhood. When it comes to buying, a good strategy is to find the most affordable house in the best neighborhood. If you buy at the bottom of the price range in a good neighborhood, you’ll have more room to build home value. For instance, let’s say you find a home that’s the only one on the block without wood floors and granite countertops. If you have the cash to make those upgrades, you’ll be able to add instant value to your home! Let’s say you found the home you want and can afford. Since you’re already preapproved for a loan, you’re ready to make an offer. If you’re a first-time home buyer, it may be hard to know how much you should offer. That’s when you can rely on the expertise of your real estate agent. Ask your agent to help you make sure your offer is competitive but also within your budget and the home’s value. Be careful not to make an impulsive offer that’s higher than you can afford just to knock out the competition. A personalized letter might help your offer stand out among multiple bids in a hot market. Once a seller accepts your offer, the closing process will begin. Keep things running smoothly by knowing what to expect when closing on a house. The average closing process takes 41 days, which gives you plenty of time to tackle closing items. A real estate agent will schedule the remaining steps, from home inspection to final walkthrough, and keep you informed about any road blocks. As you prepare for closing, make sure you read every document and ask your real estate agent to explain anything you don’t understand—especially before you sign the official contract for the home transaction. It’ll be your signature on the documents, so you’ll be the one responsible for anything you sign. Your first home is a big purchase—maybe even the biggest one you’ll have ever made up to this point in your life! Because of that, you don’t want to risk messing this up. A real estate professional will take the weight off your shoulders by helping you find a home, negotiate a deal, and see the process through until closing.